On my way home back from the office since a few years ago, my colleague used to recommend me to visit this certain hawkers in Setia Budi vicinity, Jakarta. The location? Just look around for a row of hawkers in front of The Peak Apartment and the neverending story of St. Regis Apartment and the ‘cobbles’ road in front of it. There, you shall find this hawker that goes with the name Radesa. It’s pretty clear and it’s impossible to miss it unless you’re bad at directions or they’re closed for a day in a week. I forget what day but it’s somewhere between Sunday, Monday, or Thursday. The hawker owner is an Indonesian obaasan type assisted by her son or son-in-law delivering the best of lambs every night. They have three main dishes there. The lamb satay, the lamb soup, and the lamb gulai (curry). Unsurprisingly, hawkers like them seldom experiment or experience new way of cooking or even for new dishes. Indonesian common hawkers mostly serve foods like fried rice, seafood, Chinese, ketoprak/kupat tahu (rice cakes and tofu with bean paste), Indonesian home dishes (nasi rames or nasi uduk alongside vegetables, meats, eggs, or other local delicacies), martabak (sweet or savory Indonesian style pancake), pempek (Palembangnese style fried fish with zesty vinegar sauce), soto, chicken porridge, beef/lamb/chicken/Padangnese satay, and many many many others. So, Radesa here can be said to be one of its kind around Setia Budi vicinity. To combine everything about lamb and that means to include gulai, satay, and soup is quite rare. You can find, for example, those who specialize at lamb’s leg soup that consists many parts of it starting from the meat, skin, up to the nose or even the eyes. I know it’s exotic or you can say even, gross, but it’s very delicious and you should try it however I haven’t found the the best place for it though. Back to Radesa again, I’ll break it down into details about the dishes. 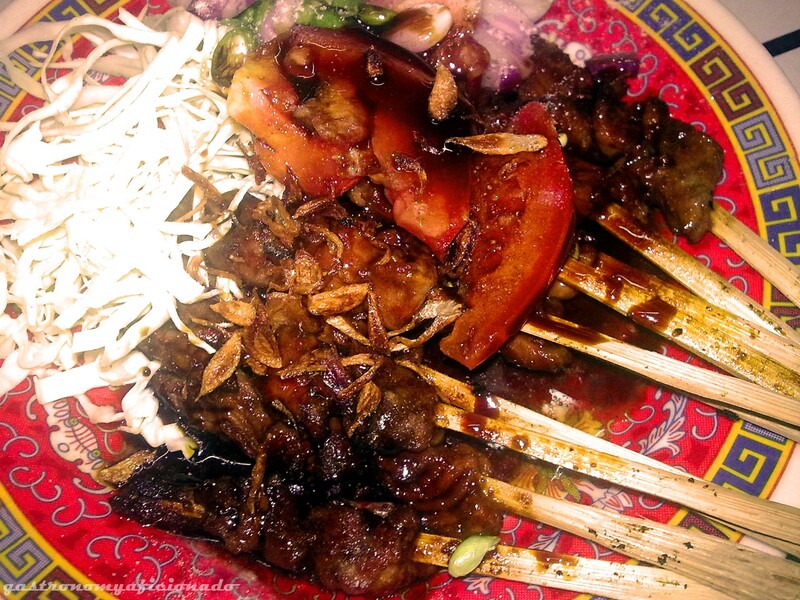 The most familiar one, the Lamb Satay (IDR 19,000), is a charcoal grilled lamb satay and will be served with Indonesian sweet soy sauce (kecap manis) alongside with the condiments such as the raw shallots, the cabbages, the bird-eye chili, and fried shallots. I didn’t really like it since the meat was not tender, it’s not that tasty and you’ll find it a bit bland since you gonna eat it only with rice but Indonesians like it that way though. Sometimes I order a bowl full of the soup broth just to make it easy to digest and add an extra flavor in it. So at the same time I can also taste a glimpse of Lamb Soup which like any other connoisseur, I can and have the ability to see the big picture even from a sip. The soup was rich and spicy, thanks to the pepper though it felt boring though with only that. Normally, you’d get potatoes or carrots inside alongside with the lamb meat, most likely around the rib area though so you’ll still need to face the bones. Watch out since it may be sharp at some edges. But the best part there would be the Lamb Gulai (IDR 17,000). Though the taste might not be too sharp for my senses and not that tasty comparing with my aunt’s home dishes. 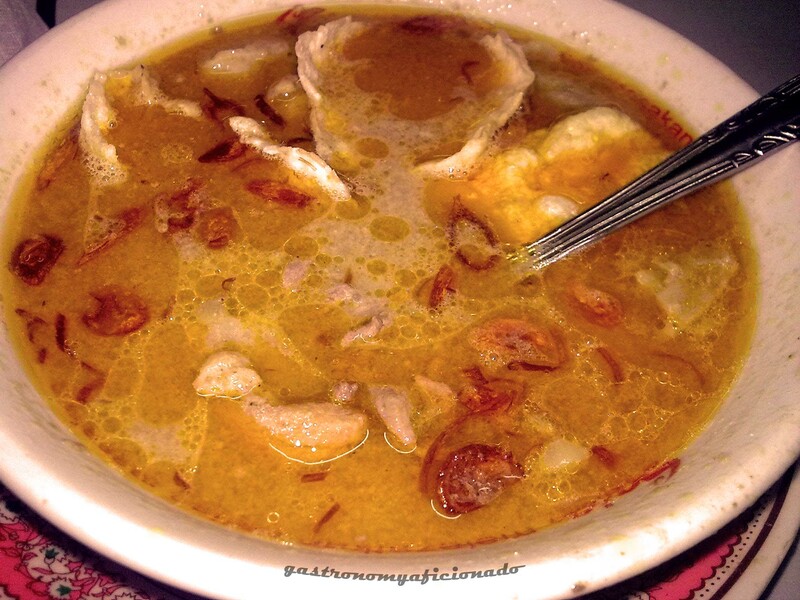 Gulai in Indonesia is more soupy instead of thick like in Japan or India but still rich in taste. The good thing here that they use tender meat so you’ll find it aside from easy digest, a good taste (not too good for me but decent enough), and nicely accompanied with a plate of warm, fluffy rice. So, whenever you’re around Setia Budi vicinity, pondering of how to face the heavy traffic outside at Sudirman Street for awhile, just stop by and the obaasan will help you ease the pain. Not exactly making it go for good though…. Jalan Setia Budi, Jakarta. See the hawkers lining up in front of St. Regis Apartment construction site.